This is the sample template for the One Sheet Wonder cards that go with the Stationary Box Tutorial, next post down. Also, pictured are the cards that I included with my box. You could alter them however you wish, this is just a guideline to show you how the one sheet wonders work. I also have the template done up below that shows where to cut the stamped sheet to use for the cards shown. Once you open the picture, you'll see the diagram shows all the dimensions for the pieces that go with each card. In bold, you'll see the card number that that piece goes with. Hope this all makes sense! lol :) I'm a weeeeee bit stressed at the moment! *On section #8, the measurements below should read 5.5" x 4.25" not 4.5"
Great work! Thanks so much for the patterns on the box and the OSW diagram. I hope you don't mind but I am going to add your blog to my blog. March 8, 2007 at 10:51 p.m.
March 9, 2007 at 1:25 a.m. Thanks for sharing the WSW and the Stationery box. Hope I'll be successful at my attempt to do both! March 9, 2007 at 1:44 p.m.
GREAT cards, you do beautiful work! And TFS your template, I'm going to try it for my holiday cards this year! November 11, 2007 at 12:55 a.m.
September 9, 2008 at 3:22 a.m.
October 20, 2008 at 11:52 p.m. Thank you for the great sample, projects and pattern! I am working on Christmas cards and I will be sure to use this OSW template! March 31, 2009 at 3:17 p.m. Thanks for the pattern and tutorial. Great idea and beautiful cards. June 23, 2009 at 3:59 a.m.
June 23, 2009 at 7:52 p.m.
April 26, 2010 at 11:53 a.m. Thanks forposting about this. I am hoping to give it a try this weekend. Cand you tell me what size the cards were that you made? April 27, 2010 at 12:48 p.m.
4 1/4" x 5 1/2. With them that size, they fit perfectly inside the sides of the stationary box. April 27, 2010 at 3:43 p.m.
Just wanted to add my two cents. 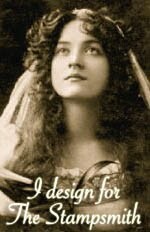 Put your pattern to the test and I was able to make 9 cards with ease. Thank you so much for sharing. My hubby already claimed one for a thank you card. I love being able to use one sheet of patterned paper to make 9 different cards. This makes for a great gift set. I did save your pattern to my computer so I can do this again and again. September 16, 2012 at 1:34 a.m.
March 4, 2013 at 10:15 p.m.
April 5, 2013 at 11:20 p.m.
What a wonderful idea! Thank you very much for sharing. November 23, 2013 at 5:29 a.m.
May 14, 2014 at 1:13 p.m.
March 27, 2019 at 6:54 a.m.
March 27, 2019 at 8:37 a.m.
April 2, 2019 at 11:26 a.m.
April 3, 2019 at 8:56 a.m.
April 7, 2019 at 6:47 p.m. 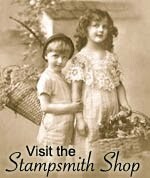 Projects including at least one Stampsmith image will be eligible to win the random draw. Winner announced on the 1st of the following month! All content including artwork, text and photographs are ©Julie Mutch. They are for personal use only and may not be used for contest entry, publication submission or monetary gain. Thanks and happy creating!